A week ago Linda Sarsour brought scorn upon herself with a speech where she called President Trump names and at one point even called for a Jihad against the POTUS. To be honest while her words created an uproar they weren’t out of character. The two usual targets for Sarsour’s hatred are Jews and the United States. On Tuesday after being exposed as supporting a cop-killer on twitter by CNN’s Jake Tapper, Linda Sarsour began using twitter to label Tapper an alt-right hater–not only false, but rather ironic coming from someone like Linda Sarsour. 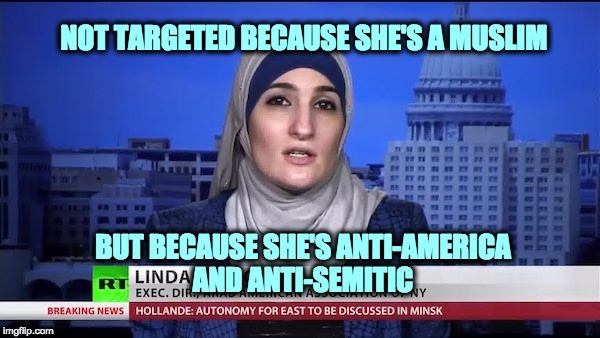 The irony comes from the fact that while Linda Sarsour isn’t alt-right, she is a hater, and Tapper’s Jewish making him a target of many in the alt-right, and the hatred of Sarsour, an anti-Semite. One thing to say about Sarsour, at times she is “new school.” Much of modern Antisemitism is different from the traditional Jew-hatred, it is disguised as anti-Zionism, and claimed to be simply criticism of Israel. In 2009 while Barack Obama was president, the US State Department defined Antisemitism. The list was long but one of the items was, denying the Jewish people their right to self-determination [also known as Zionism], and denying Israel the right to exist . Sarsour believes the Zionists cannot be feminists. “It just doesn’t make any sense for someone to say, ‘Is there room for people who support the state of Israel and do not criticize it in the movement?’ There can’t be in feminism. You either stand up for the rights of all women, including Palestinians, or none. There’s just no way around it,” . So according to Sarsour the rights of all women don’t include women who believe the Jewish people have the right to self-determination. She should try to explain that to my friend Dr. Phyllis Chesler who is not only a Zionist, but an internationally recognized leader of the feminist movement. Sarsour also supports the anti-Semitic Boycott, Divestment & Sanctions (BDS) movement, an initiative that uses various forms of public protest, economic pressure, and court rulings to advance the agenda of permanently destroying Israel as a Jewish nation-state. The Democratic Party protected Jew-hater also falsely maintains that a “Palestine existed before the State of Israel,” which according to the historical record is untrue. There was never a state of Palestine. After the Bar Kochba revolt in 135 CE, the Romans punished the Judeans (Jews) for revolting for the second time in sixty years by changing the name of their country from Judea to Syria Palaestina (after the ancient enemy of the Jews, the Philistines who were destroyed a thousand years earlier). After the Romans, the holy land was ruled by the Byzantine Empire, the Ottoman Empire, and finally the British mandate before it once again became the Jewish State in 1948. Throughout that time all of the holy land including Jerusalem had a very large population of Jews. The hate-monger Sarsour doesn’t expend all of her venom on Jews. When asked about the statement by a Dartmouth student during a speech there in May 2017, Linda Sarsour first replied that the questioner had no right to ask a question because he was a white male. The 37-year old Sarsour went on to say she made the comment when she was young, first claiming she made the statment ten years ago, then seven years ago (it was six). Truth be told she was 31, young compared to some, but certainly adult-enough to be responsible for what she says. “Well, the way that works in our country right now is that there is law and then there is national security. So anything in the name of national security, every law goes out of the window … So yes the FBI is – if not the same – worse than the NYPD. And it’s not just the FBI. Let’s talk about our CBP, border patrol, between the American and Canadian border. And don’t forget what started yesterday’s twitter battle, Sarsour is a supporter of Assata Olugbala Shakur, also known as JoAnne Chesimard. On May 2, 1973, Shakur then a leader of the Black Liberation Army, and two others were driving on the New Jersey Turnpike when they were stopped for a routine motor vehicle violation by two New Jersey State Policemen. Already wanted for several felonies including armed bank robbery Chesimard and her accomplices opened fire on the state troopers. One trooper was wounded and the other was shot and killed execution-style at point-blank range. She was found guilty of first degree murder, assault and battery of a police officer, assault with a dangerous weapon, assault with intent to kill, illegal possession of a weapon, and armed robbery and got a life sentence. Unfortunately she escaped prison and fled to Cuba. This is the type of person Linda Sarsour supports. Underwear bomber was the #CIA all along. Why did I already know that?! Shame on us – scaring the American people. An Islamist activist honored by the White House last December as a “Champion of Change” called Zionism “racism” this week and said “nothing is creepier” than the belief in a Jewish homeland. Linda Sarsour also posted two links on her Twitter feed to a rabidly anti-Israel video by a New York poet that accuses Israel of ethnic cleansing and mocks interfaith dialogue as selling out. Sarsour has been invited to at least seven White House meetings since April 2010, records show. All but one were with Paul Monteiro, associate director of the White House Office of Public Engagement. The most recent meeting took place seven months ago. Last week, the Investigative Project on Terrorism reported on hundreds of White House meetings involving radical Islamists like Sarsour. Sarsour, director of the Arab American Association of New York, is on record defending terror suspects, casting skepticism over law enforcement investigations and advancing conspiracy theories. Despite her access to the administration, Sarsour described support for President Obama as a “lesser of two evils” proposition for Muslim voters. @jacobkornbluh sometimes we have to choose between the lesser of two evils. We did that in 2008 and now we need to do it again in 2012. She also believes there is a government conspiracy against Muslims and that the authorities were behind Malcolm X’s assassination. During a Feb. 23, 2012 interview with Russia TV, Sarsour claimed that “Islamophobia” today is a continuation of the genocide of native Americans and the slavery of African-Americans. “This has happened throughout the history of our country; our country was based on, you know, genocide on native Americans, based on slavery, racial profiling has existed for centuries in this community,” she said. Wait a second, she appeared on RT!?!? Didn’t the Democrats go after General Flynn for that? Linda Sarsour is an American, born in Brooklyn, New York yet she slanders America, the country that took in her parents and gave them a home when they immigrated from what she calls Palestine. The same country that gives her the right to trash it publicly whenever she wants. That’s the worst thing about Linda Sarsour. Because the same United States gave my family a home over a century ago. My Dad of blessed memory once told me the story of how his father’s family ran across the rooftops of Odessa, fleeing another pogrom by the cossacks. As they ran, they they carried the youngest children who couldn’t run, all to escape to this wonderful land. They first went to Galveston, Texas; moved to New Orleans, and finally settled in the very same Brooklyn, New York, where Linda Sarsour’s parents settled. Instead of spewing hatred and slander, Sarsour should feel some degree of love and appreciation for this country as my family does. After all, America protected both of our families giving us the freedoms offered to all Americans. She also slanders the law enforcement people who protect both of our families every day, and the leaders of the federal government who we don’t have to agree with, who we can (and should) criticize them in public and private, but we should respect their offices enough not to slander them with lies. Linda Sarsour also slanders the Jewish people, my people who after 1,700 years of exile received the opportunity to return to their homeland. Ms. Sarsour believes that anyone who points out her hatred is an alt-right hater. Sorry, I am a conservative, but not alt-right, Jake Tapper is a newsman who tells what he believes is the truth. My issue and I would dare say Tapper’s issue with her has nothing to do with her Muslim faith, but everything to do with the fact that she trashes my beloved America, and the Jewish people of whom I am proud to be a member. Oh and before anyone brings up the vandalized Colorado Jewish Cemetery for which Linda Sarsour raised money for and promised to give $100,000–it’s over seven months later and the cemetery hasn’t seen a penny. A Bedouin came to the prophet, grabbed the stirrup of his camel and said: O the messenger of God! Teach me something to go to heaven with it. Prophet said: “As you would have people do to you, do to them; and what you dislike to be done to you, don’t do to them. Perhaps Ms. Sarsour should spend a bit more time studying her faith.